Hellfire Pass on the infamous Thai-Burma "Death Railway"
Frances flew to Vietnam on Friday evening. We had fun that morning at the Vietnamese Embassy in Bangkok because my darling daughter had forgotten to do anything about acquiring a visa - even though The Great Pudding had warned her about this back in January. If it had been anybody else, their ears would have been ringing with earthy Yorkshire expletives and I am not talking about "Ee by gum!" or "Cripes!". Anyway, to our mutual relief the visa was waiting for her when we returned to the laid back and understaffed embassy visa office at three thirty. Her flight was leaving at seven thirty. Many people have been sent back from Vietnam for failing to sort out visas ahead of travelling... especially Americans who for some reason are not the country's favourite friendly nation. I can't think why. Ahh...I have made it to the half term holiday - one week and one day off before the next stretch up to Easter which this year co-incides with the Buddhist New Year - what the Thais call Songkran. Tomorrow our daughter, Frances, is scheduled to arrive in Bangkok. I will meet her at the international airport whose long name - Suvanarbhumi - means "the golden land". I rather like that. Conversely, I think Heathrow must mean the opposite! On Sunday morning, we will take a government bus down to the island of Koh Samet in the Gulf of Thailand. 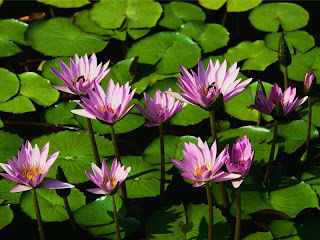 It is popular with Thais and by car is only two to three hours from Bangkok. Fortunately, we will mostly be there during the week for weekends can be especially busy. We're staying at Jep's Bungalows close to the beach but as you can see from the photograph - everywhere is close to the beach! After five days in Koh Samet, Frances will fly over to Ho Chi Minh City (Saigon) in Vietnam to see an old school friend who is living and working there. Then she'll come back to Bangkok and hopefully we will have enough time to see some of the sights. She is also going to spend a day in the primary section of the school. Last Sunday evening I went to Chinatown where Chinese New Year celebrations were in full swing. Some streets were temporarily pedestrianised and there were hundreds of food and souvenir stalls. Thousands of people - often in red shirts thronged the streets and at eight o'clock Princess Srindhorn arrived amidst tight security and much palaver. 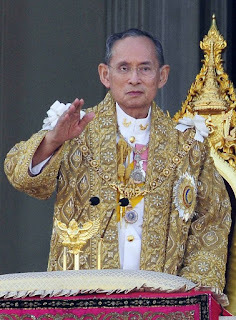 The Thai Royal Family are greatly revered and foreigners are advised to avoid asking questions about them - especially the demigod King Rama IX - Bhumibol Adulyadej who came to the throne in 1950 and is the world's longest reigning monarch. His image is everywhere. Never let it it be said that I do not now how to bore the pants off people. I realise that there has been a lull in my blogging caused mainly by ongoing internet connectivity issues. But now I have found a little space in time in the school computer lab, all that I have got to offer you is an essay I have just composed for "The Bangkok Post's" current essay competition. The prize is a Google computer tablet. So if you're having trouble sleeping why not read the following... zzzzzzzz! Great world cities are not about buildings, business or transport links, they’re about people. This is a truism that the new governor of this bustling metropolis must take on board if there is to be a sea change in Bangkok’s voyage to the future. Unpicking this umbrella aspiration, I want to think here about pedestrian experience, the importance of taxis and information provision. At a very basic level, there are areas of Thailand’s sprawling capital where to be even an able-bodied pedestrian is to engage in a daily life-threatening gamble with unforgiving traffic. Bangkokians have developed a sixth sense about traversing roads and road junctions. They have well-developed survival techniques but “farangs” often stand perplexed - trying to muster enough courage to dodge endless lines of oblivious motor vehicles. It is time for pedestrian crossings with flashing lights, for sensible speed limits, for underpasses and above all for an education campaign that makes drivers realise that the safety of pedestrians takes priority over their own urgency to get from A to B. Diligent enforcement will also be vital. Parenthetically, I shall merely flag up the unspeakable difficulties faced by disabled pedestrians in Thailand’s capital for their plight deserves exclusive and sustained examination. The city’s famous legions of taxis have a very significant role to play in facilitating movement around the greater urban area and yet foreign inhabitants frequently have great difficulty in communicating their desired destinations to drivers who customarily demonstrate minimal appreciation of those communication problems. Standard laminated city maps in both English and Thai ought to be available in every taxi with drivers being funded to attend short training courses that bolster their understanding both of English and of the important role they have to play in lubricating the multicultural wheels of this city. On wide arterial roads, there should be peak time priority lanes reserved entirely for public service vehicles – including taxis, making journey times significantly shorter. It is nonsensical even to contemplate the notion of a harmonious, culturally diverse Asian city when stuck in yet another interminable traffic jam. So those are the first two proposals that should greet the new governor when he checks his in-tray that first morning in office and now let’s deliver the third item. When it comes to personal communication tools, the world’s new shakers and movers are technologically very savvy and Bangkok itself has unwaveringly embraced these new technologies. However, long and short term visitors and new immigrants from all over the world are currently unable to access a comprehensive and well-maintained municipal website or officially maintained phone apps that will alert them to cultural or business events, restaurant locations, hotels, weather and transport news. That should be something that the new governor pushes from day one. Not everybody reads “The Bangkok Post” or its associated website which besides have different functions. Unquestionably, Bangkok is an exciting, vibrant city but the key to accessing it and fully understanding it is reliable and lucid information. At Suvarnabhumi and Don Mueang there should be free city guidebooks prominently displayed and replenished regularly, internet access points, friendly meeters and greeters and within the downtown area better signage and fixed city map displays, illuminated in judiciously selected locations. It’s these practical details that matter much more than bland election promises. Sometimes this vast conurbation can appear rather dauntingly monocultural – possibly because Thailand itself has such a proud history of independence and self-reliance. But our planet is shrinking owing to increased geographical mobility and burgeoning interpersonal communication channels enabled by new technologies. Multiculturally speaking, if Bangkok is to join the premier league of world cities it must first recognise and accept that putting people first is the hallmark of every successful modern city – be it Berlin, Brasilia or Brussels. Yes, people - in all their beautiful, prismatic diversity. Should the new governor ignore this simple reality, his tenure will undoubtedly be doomed to failure. Backtracking to last weekend... Again, it was good to get out of the city into green countryside on the edge of the jungle. At the Khao Yai sister school there are only one hundred and two pupils but twenty seven teachers and of course an army of ancillary Thai workers. A fifty metre swimming pool, a huge sports hall, a canteen that could cater for a battalion of soldiers and three tennis courts. It really is a crazy world. The ex-pat staff who live and work up there, three hours from Bangkok, must be exceedingly bored much of the time. It wouldn't be for me. The highlight of last weekend was visiting two bat caves. The first one was located adjacent to a Buddhist temple and we had to descend a treacherous concrete staircase to the limestone caverns below. There as well as hundreds of roosting bats we saw little sanctuaries, altars to the Buddha and several small but amazing cave-dwelling creatures that feed on the bats' droppings. Giant centipede which feeds on bat guano. Deep in the limestone cavern - a Buddha sits peacefully in the lotus position. you can see the plume of bats heading for the forest. It is perhaps no surprise then that the Chinese New Year is widely celebrated in Thailand and today the primary school children all turned out in silky Chinese costumes. There was Chinese drumming and a dragon dance and a woman dressed in a giant panda costume startled me on the corridor next to my classroom. I think she hoped I mght have a bamboo shoot for her. At the Chinese caligraphy activity table, I held a special paint brush upright and did my best to copy the Mandarin symbol for "sky" - see above. I would have loved to scan my own attempt but alas I can't find a scanner. It was the first Chinese symbol I have ever written though I have had many Chinese meals - the symbols for which are often cunningly applied to the sunburnt shoulders of numbskull holidaymakers by mischievous tattoo artists. In the room opposite my classroom, Miss Lynn teaches Mandarin Chinese. Thais are well aware of the increasing importance of Chinese in economic terms but they have a special affnity for Britain and I see many union jacks on clothing, handbags, purses etc.. You see hardly any American icnography. At the recent parents' evening a wealthy mother laughed with disdain when I suggested her son might attend a summer school in Australia, Canada or America. "No. We like England. That where English come from!" And four of the boys who were in my previous form group are now at boarding schools in England. By the way, Chinese New Year is on Sunday Februuary 10th and we are about to enter the year of the snake. Should be a good year for Tony Blair, Jeremy Kyle and Richard Hammond methinks. "Freedom" by Jonathan Franzen is a great novel. I finished it on Saturday night up at Khao Yai, not long after I had returned from a guided tour that involved bat caves and the eventime migration of a million bats seeking insects and fruit in the nearby forest. An amazing spectacle. The novel was given to me by my old friend Tony just before I left my sceptred isle on the edge of mainland Europe. Franzen is a hyperactive, gifted writer with a passion for words and a consuming fascination with domestic and familial relationships. The book is set in America and details the interwoven and often dysfunctional lives of the Berglunds - Patty, Walter and Joey and Jessica. Environmental issues, the acquisition of wealth, sexuality, fantasy and the nature of honesty are just some of the themes that Franzen investigates. His lingustic embroidery is often quite breathtaking and there is an energy and anmation about his writing that is rare. ﻿Les Miserables? I thought he was a comedian from Bradford - big on the working man's club circuit. Then I realised the film's title was in French so it was probably going to be about the SMT (Senior Management Team) at my old school in Sheffield - The Miserable Ones. Funny that isn't it? Back home the majority of teachers are such anxious, miserable s.o.b. 's that it is engrained in their faces - and they say that education should be enlightening! But as I settled down into my plush cinema seat at the Major Cineplex in Ratchayothin, north Bangkok it suddenly dawned on me that I was about to watch a musical based on Victor Hugo's famous novel and not SMT members launching yet another tiresome "initiative" or dashing about school corridors chanting their silent mantra - "Do as I say, not as I do!". The opening sequence of "Les Miserables" was awesome with hundreds of convicts and slaves pulling a broken warship into the dock of some French seaport as Russell Crowe's character Javert looked down from the high wall above - asserting justice, harshly protecting the righteousness of the French state. I don't know if Anne Hathaway herself was singing the Susan Boyle song "I Dreamed a Dream", but this was a very moving section of the film and if the sound had been muted I would have still marvelled at Hathaway's emotional portrayal of this awful nadir in her character Fantine's tragic and economically blighted life. The costume, make-up and hair in this excellent production deserve huge applause. There was such dirty, rotten detail in the players' fingernails and teeth. Sitting in a theatre with Dolby digital surround sound literally surrounding you really heightened the impact of the movie. However, having enjoyed the London stage version of this famous musical there was something inordinately odd about a film plot that was advanced almost entirely through song. A dark cinema allows for a more intimate, private experience than a West End theatre customarily provides. I am not inclined to follow suit by conducting professional and private communication through song as I fear this would soon involve the arrival of an unmarked van from the nearest lunatic asylum! But hey, I am still glad I bothered to go and see "Les Mis" and from me it gets a thumbs up for sure.